In celebration of Earth Day, en.v – an organization dedicated to promoting social responsibility and environmental sustainability in the Arab world – has developed an interactive art installation to be displayed at The Scientific Center as part of the organization’s REUSE program. The interactive art installation, which takes the shape of a seven meter life-size whale constructed with a steel frame and wire mesh material, encourages participants to weave used plastic bags into the frame, thus reusing them in a creative way to complete the outer-body of the installation. This ‘crowd-sourced’ activity targets students who will be visiting the Scientific Center from private and public schools in Kuwait and visitors from the general public to raise awareness on the effects of consumer waste on Kuwait’s marine environment in a collaborative fun way. 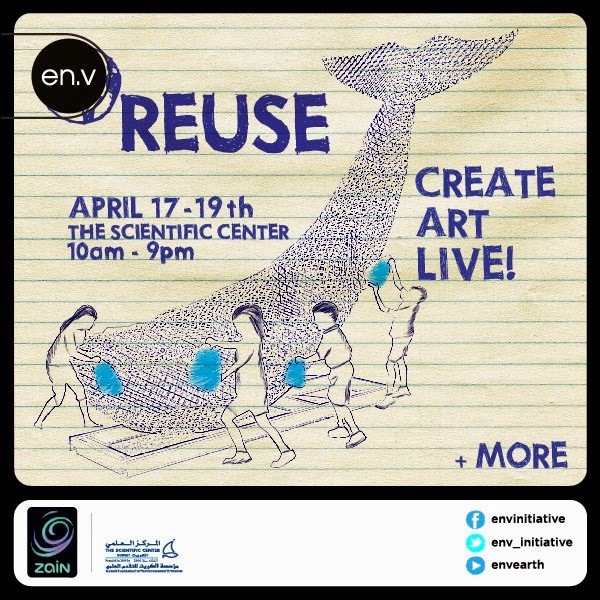 Show your support for the cause by visiting the REUSE whale at The Scientific Center from the 17th to the 19th of April, 2014, between 10am and 9pm. The event will include an environmental fair with engaging activities from a number of local environmental and educational initiatives, as well as live music on Thursday and Friday evenings from 6.30pm to 7.30pm. REUSE is a program initiated by en.v in partnership with Zain Telecommunications to promote environmental sustainability and community participation in Kuwait. The program includes activities such as educational roadshows and competitions, community events, online environmental campaigns and workshops taking place throughout the year.